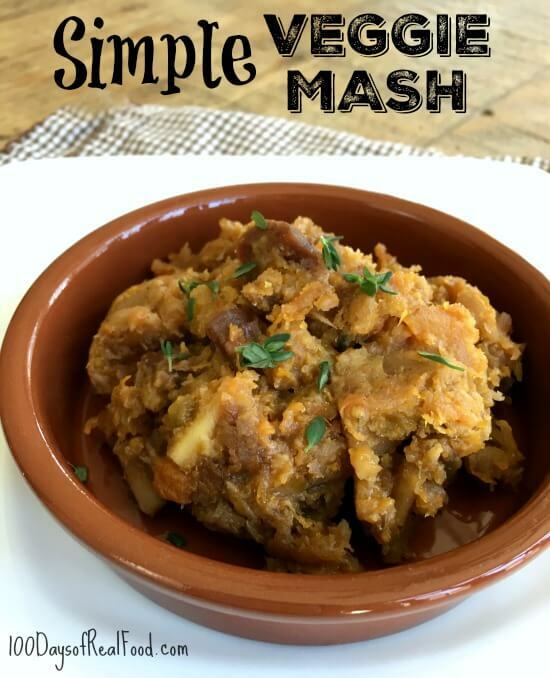 This Veggie Mash recipe is such a great alternative to roasted veggies because it takes almost half the time. Not to mention it’s a great way to switch up your veggie side rather than serving the same ol’ salad or steamed green beans. 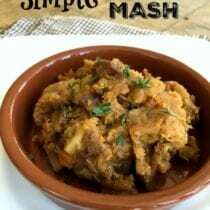 I served it with braised short ribs and gravy on top, and it was a huge hit at my house – enjoy! Melt 3 tablespoons of the butter in a sauce pot over medium-high heat. Add the diced root veggies, garlic and thyme and cook while stirring occasionally until they begin to soften, about 10 minutes. Add the honey to the pot and stir for a minute or so until well combined, then add the water and bay leaf to the pot, turn the heat down to low, cover and simmer for another 10 to 12 minutes or until the veggies can be easily pierced with a fork and the water is mostly absorbed. Remove the bay leaf, throw in the last tablespoon of butter, and mash with a potato masher (or the back of a fork) until chunky. Garnish with extra thyme (if desired) and serve warm. I served mine with Giada’s ‘Chicken Marsala Meatballs’ & the warm bacon salad from Lisa’s book as the first course – this side was hearty, flavourful & veggie packed! My 2 year old doesn’t like anything that resembles baby food, so the mashed combo won’t entice her to eat. Are there any other ways to get her to eat more veggies without tricking her? This is one of my favourite ways to serve root veg- no matter the quantities, it always tastes delicious! What an awesome way to get more root veggies in the diet! So warming and comforting and perfect for what’s left of the cold weather. I love celery root, but I only prepare it a few different ways. Love that I can add it to this mash. I live in Charlotte, NC and was wondering where do you buy celery root? Hi. Lisa does most of her shopping at Earth Fare and the Matthews Farmer’s Market. Umm. Of I tried to serve that to me children (or even my husband ) I would be told it looks like vomit. Sorry. What a great idea!! Switching up the plain ‘ol potato for something more adventurous sounds great! Nice recipe :D i wanna make it for my friend , Thank you very much ! I think wanna make it for my friend :D Thank you !